Last night's festivities had us listening to Wagbeard's back catalogue this morning (if you missed the show last night, word is they're playing at Bamboo ce soir), and chance led us (via the Primrods, 'natch) to Pal Joey. We already posted a demo of this great Edmonton band's last spring, although we completely goofed up most of the facts around that tape (in our defence, it did give us reason to post one of the best rock photos ever to come out of this city). So we're going to try to make things right with a collection of another two tapes from Edmonton's great purveyors of Replacements gone roots power pop. The first is their 1993 tape, Repent Sinners, which predates Lorrie Mattheson's involvement. A comment in last year's post indicates that this their second tape, and it's pretty damn good. To our ear, it has a lot in common with Fire Engine Red's fantastic 1530 (we had to drop a Fire Engine Red reference in here somewhere - they're one of the bands we'd really like to see play again. Please take note, Mr. Jett Thunders, for the next CJSW anniversary bash). 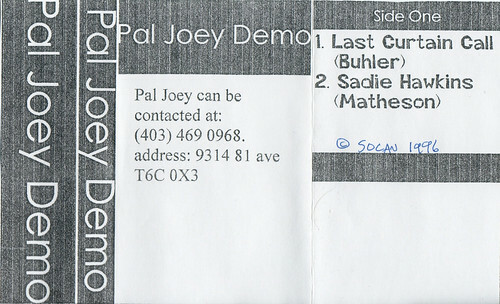 The second tape is a demo from 1996, featuring one more song by Trent Buhler and Lorrie Mattheson's "Sadie Hawkins" (we think this is the same version that shows up on Local Band Seeks Fans). To also bring things back to Wabeard, we were pretty excited to see Lorrie joining the Beardos onstage for TNT last night. But mostly because at first we thought they playing a Primrods cover. Also in the comments of our previous PJ post, Pal Joey Alumni Janice Frisch pointed us to some additional tunes; you can repent or get the demo here.